Fly fishing in January? Most people are pretty incredulous when you say this to them in the middle of the winter in Jackson Hole, WY. It’s easy to see why; after all its ski season. 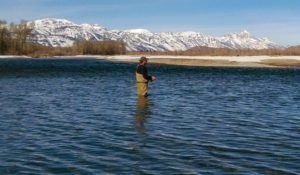 The ice flow in the Snake River is often at its greatest this month and daytime highs might only reach into the single digits. It can be hard to motivate! But, when fronts move in with some snow, temperatures can soar into the high 30’s, possibly even 40 degrees. It feels like a regular heat wave and our Cutthroat sure do take notice. Feeding is mostly sub-surface on Midge nymphs, but the occasional riser can be seen in the shallowest of water on the edges of riffles or the tail end of pools. Mountain Whitefish are sure to be part of your catch when fishing nymphs. It feels good to have them tug on the line and sometimes you’ve got to pull a few out of a hole before the Cutthroat show up. Fishing in the months of January through March often entail using snowshoes to get through streamside snowbanks. The best times to be out fishing are between 12:30 – 4pm, coinciding with the warmest part of the day. There really is no need to fish any longer due to the law of diminishing returns. It’s best to enjoy the few hours that are worth it and then head home.